Shooting games have always been inn in the market because of their adventures feel, in more recent days there are multiple type of shooting or throwing games has been developed for Smartphones such as Android Platform. Most popular of the one that hits our mind is paper toss, but today the Android game we are presenting at techtabloids has its own uniqueness, the game you have never experienced before it’s a Bottle Shoot which involves as its name suggest shooting bottles. Bottle Shoot Game involves a series of different types of Glass bottles placed in a line on a table, Player has a stone which needed to be thrown towards the bottles to crush them. Place your finger on stone and drag it towards the bottle like throwing it towards bottles in the direction as they are placed. The game includes a target score which player has to meet or can score above than that to cross the stage, plus there is a time line visually a progress bar which keeps on running so the player has to catch up with that. With the progress of stages difficulties also comes with it such as a blue color shield be placed for some time in front of any one bottle placed in a series if the player through stone where the shield is placed stone will be rebounding in the opposite direction. One more obstacle is bombs which are placed in front of the bottles if a player hits any of the bomb game fill finish then and there. 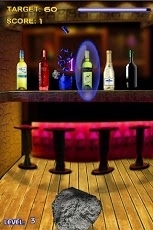 The player gets more points if hit five or more bottles continuously. The game has good effects, sound quality of shooting bottles also feels real plus multiple color and different types of bottles gives a good feel to the game. According to me a good game and an addictive plus enjoyable game which keeps you busy. Also if you can take down your frustration on these bottles while you are playing and nothings get down broke in real. Must try this game its Free on Google Play.